The German physiologist Wilhelm Friedrich Kühne was born in Hamburg on 28th March 1837. He discovered much of what we know about how muscle and nerve tissue work, the nature of vision and the chemistry of digestion. He also coined the term enzyme (meaning literally “in yeast”) and, perhaps slightly less to his credit, was one of the last bastions of sexism in science – saying that he would “never allow skirts in his lectures” when confronted with would-be student Ida Henrietta Hyde. Kühne studied first in the lovely university town of Göttingen (well known to us at the Frog Blog), and then in Jena, Berlin, Vienna and Paris. He eventually became Professor of Physiology in Amsterdam, and then in Heidelberg. After producing a PhD thesis on induced diabetes in frogs his early studies looked at chemical changes which occur when light strikes the retina – eventually leading him to introduce the term rhodopsin to describe the pigment found in the rod cells of eyes. According to the Oxford Dictionary of Science, in order to investigate the workings of rhodopsin he put a cloth over a rabbit's head (to reduce light and allow the pigment to accumulate), then placed the rabbit facing a barred window. After three minutes the rabbit's head was cut off and its retina was removed and fixed in alum, clearly revealing a picture of the window(!). Kühne went on to investigate the way that nerve fibres conduct impulses and in 1876 was the first to describe a protease when he isolated (and named) trypsin from pancreatic juice. 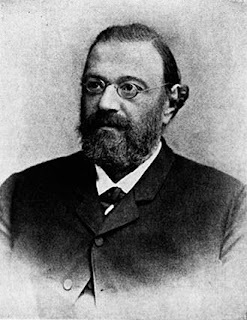 Kühne died in Heidelberg on 10 June 1900.